State legislation in June 2017 allows Nevada's tribes to negotiate medical marijuana compacts with the state for the use, cultivation and sale of marijuana on Indian reservations. Although these compacts are not legally necessary for tribes, the compact acknowledges the tribes federal marijuana rights, and the tribes agree to follow state laws. There are seventeen federally-recognized tribes in Nevada. The DOJ marijuana policy on tribal reservations applies to these Nevada tribes. Each is federally recognized as sovereign by the Bureau of Indian Affairs in the U.S. Interior Department. Cannabis is legal in Nevada for all uses by adults, and the state government has approved laws for all Nevada tribes to grow and sell marijuana on their reservations. For a complete list of Nevada tribes and their locations, see our page about Nevada Tribes. Many Nevada tribes recognize the challenges and business opportunities of the cannabis industry, but have not announced their interests or any business plans. Others have accepted the challenges, announced their plans and started cannabis business on their reservations. The Ely Shoshone Tribe and the Yerington Paiute Tribe are the first tribes in Nevada to sign marijuan compacts with the state. Senate Bill 375 was passed and signed in June 2017 allows the governor to negotiate and sign marijuana compacts with all Nevada tribes. 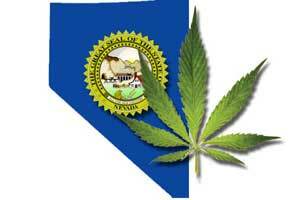 The Las Vegas Paiute Tribe has also signed a marijuana compact with the state. Las Vegas Paiute Tribe Opens "Largest Marijuana Store on Planet"
The Las Vegas Paiute Tribe celebrated the opening of their Nuwu Cannabis Marketplace near downtown Las Vegas. 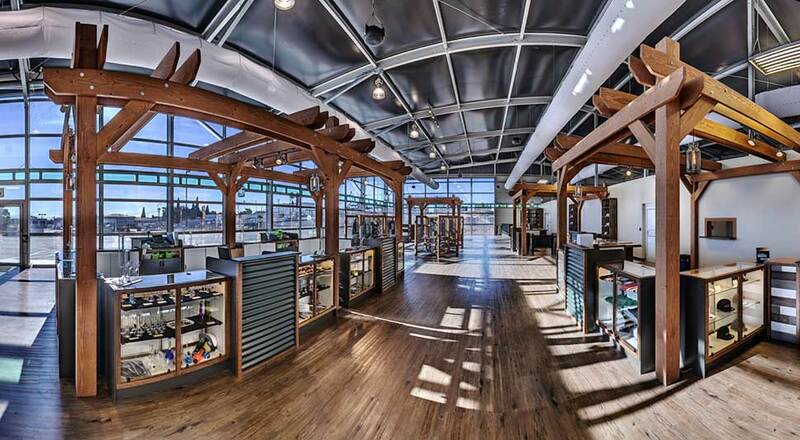 They claim their 15,800 sq-ft store is the largest marijuana retail outlet in the U.S. The store is located about 1.5 miles from Fremont Street Experienceat at 1225 N. Main St (north of Washington Avenue). 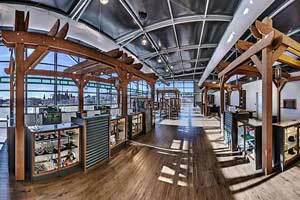 It has a 168-foot checkout desk with 13 point-of-sale terminalsthat can serve up to 2,500 customers a day. By the end of this year a second Nuwu marijuana dispensary will open. The dispensary is owned by the Las Vegas Paiute Tribe. It will be built on land owned by the tribe and located near their Centennial Hills golf resort. The tribe's original dispensary in Las Vegas is 15,800 square feet. The new location will be nearly a third of that size. It will also have a drive up window open 24 hours. Similar to the Las Vegas location. An official opening date has not been scheduled. However, the tribe is hopeful for the project to be completed by the middle of December or early January. The Las Vegas Paiute Tribe has other plans for expansion as well. They are working on plans to grow and cultivate their own marijuana on their land. This could be in operation by the end of next year. A local dispensary for marijuana has secured a very unique advertising for a sports team. 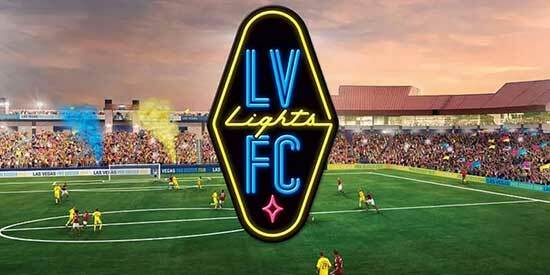 The Las Vegas Lights have signed a deal to be sponsored by the NuWu Cannabis Marketplace. On Friday the announcement was made by the team. This is the very first time a professional United States sports team has received sponsorship from a cannabis dispensary. The announcement was made by the team by using a promotional video. Close to 20,000 views had happened within just three hours of the video's release. The NuWu Cannabis Marketplace is owned by the Las Vegas Paiute Tribe. Both medicinal and recreational marijuana is sold at the store. The largest marijuana dispensary in Las Vegas opened in October of last year. It was built on land owned by the tribe. It is located just north of Washington Avenue and next to the Las Vegas Paiute Tribal Mini Mart. Advertising for the dispensary will be located at the stadium for the team. The Lights play at Cashman Field. When the team has games, there will have a sign located on the field's right side advertising the dispensary. The store is located two blocks away from the stadium. 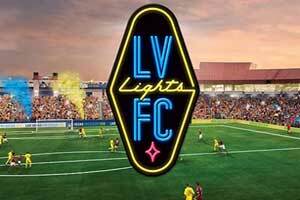 The first season for the Las Vegas Lights began in March of this year. They are a Division II part of the United Soccer League. Within the United States and Canada there are over 30 teams in the league. The sponsorship from NuWu Cannabis Marketplace for the Las Vegas Lights is seen as a way for the company to help de-stigmatize cannabis. 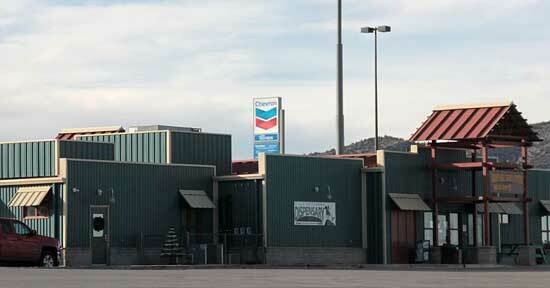 On the Ely Shoshone Tribal land is a truck stop and convenience store. Also located here is cannabis dispensary named Tsaa Nesunkwa. It opened in October and only offered medical marijuana. Now it also offers marijuana for recreational use. This is the closest dispensary to Elko. It is located off of U.S. Highway 93. On October 21 the dispensary began selling medical marijuana. Beginning in November, recreational marijuana became available. On December 2 the dispensary hosted the grand opening. This is the reservation in Nevada to offer recreational marijuana. A compact was agreed upon by Gov. 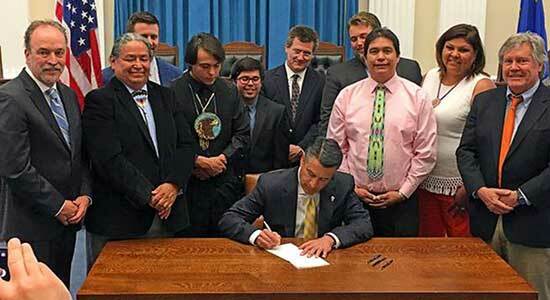 Brian Sandoval, the Ely Shoshone Tribe and the Yerington Paiute tribes. The compact allowed for the selling of marijuana. On June 2 the governor signed Senate Bill 375. Last year SB 375 was signed into law. This gave way to the legal selling of marijuana. 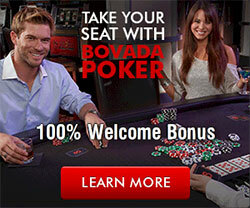 This may be a lucrative business for Nevada's Native American tribes. The Las Vegas Paiute Tribe own and operate NuWu Cannabis Marketplace. The 15,000 square foot facility is known as being ultra modern in design. The state's tribes agreed on the compact that would allow for the selling of marijuana on their land. The compact was approved in Senate Bill 375 and the bill was signed by the governor last year. Under the bill, agreements can be made between the tribes and the state that would allow for the selling and consumption of cannabis on tribal land. The tribes must adhere to the standards and guidelines that the state's private dispensaries are also held to. However, tribes are allowed to keep the sales tax that is charged on the marijuana purchases. Money that the tribes earn from their own sales tax goes to fund social programs for their members. This includes health and safety services and infrastructure. Nevada has 29 different Native American tribes. A soft opening happened on Monday for what is being called the largest marijuana store on the planet. It is a 15,500 square foot marijuana dispensary located in downtown Las Vegas. Located off of Main Street and Washington Ave on tribal land owned by the Las Vegas Paiute Tribe. It was built near the Las Vegas Paiute Tribal Mini Mart. A private event was held the Saturday before to celebrate the opening. The 200 guests in attendance were tribal officials their families, and other elected officials for the state. The land is 31 acres. Not many people outside of the tribe realized it was owned by the Paiute. On Paiute Circle is where they built NuWu Cannabis Marketplace. The meaning of the name is the people. Over 500 cannabis products will be for sale at the store. The goal to eventually offer 1,000 products. It is estimated that the store will have 2,000 to 3,000 customers each day. As of now operating hours will be 10:00 am to 2:00 am. In the near future the store will be open 24 hours daily. The NuWu Dispensary created 100 new jobs. In 2017 Senate Bill 375 was approved and allowed for the development of marijuana operations to take place on tribal owned land. 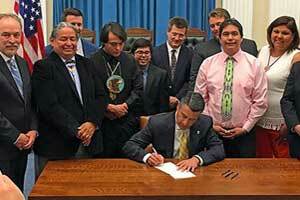 The Bill also allowed federal laws that limit tribal and congressional commerce talks to be bypassed by the governor's office. On June 02, 2017 the Bill was singed into law. On July 18 a compact was agreed upon between the state and the tribe that allowed for the NuWu to be built. A bill was signed in June by Gov. Brian Sandoval that gave permission for cannabis to be grown, processed, and sold by Nevada's Native American tribes. There are 27 tribes in the state. A compact has been signed between Nevada and the Ely Shoshone Tribe and the Yerington Paiute Tribe. 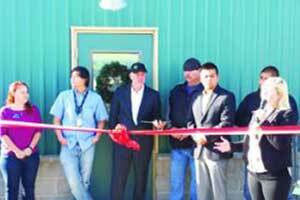 Both tribes have interest in growing, testing, and dispensing marijuana. Also they want to issue cards for medical marijuana use. The Las Vegas based Paiute tribe intend to open their medical dispensary in September. They will be joined with the Yerington Paiute and the Ely Shoshone Tribe in the venture. The project is intended to help their communities grow their economies. Both the tribes are located in very rural areas. The money will go to help their members as well support services. The tribes are mostly interested in medical uses for marijuana over the recreational uses. The Nevada tribes are working towards code regulations that will allow them to issue medical marijuana cards. These cards will also be recognized by the state. In 2013 a memorandum was written for the Department of Justice by James M. Cole. This has been nicknamed the Cole memo. This memo moved priorities away from strict marijuana law enforcement to a more relaxed enforcement. This led the way for individual states to decide how they wanted to proceed with cannabis regulations. Under the memo, the federal prosecutors would not enforce the federal laws as long as the states with some form of legalized marijuana laws also had regulations in place. Such as ways to control the farming, processing, distribution, and sales.